The BUG RUN was held on April 7th 2018. This was the 6th annual race by Jadon’s Hope Foundation. 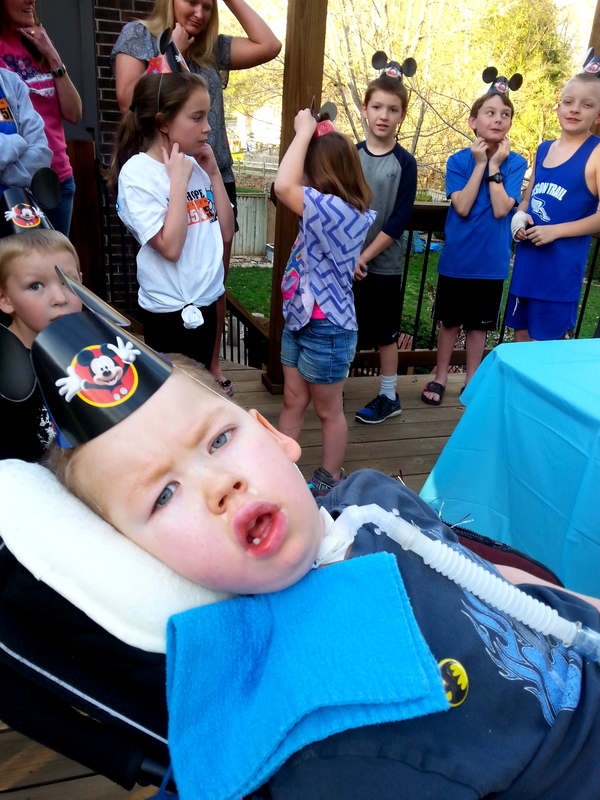 Jadon’s diagnosis ripped our dreams up into tiny little pieces and tossed them to the wind. SMA took our dreams and left us to hope for things that were merely expectations prior to those 3 letters entering our lives. We have dreamed about milestones like living to be six months old, a year, and then two years. 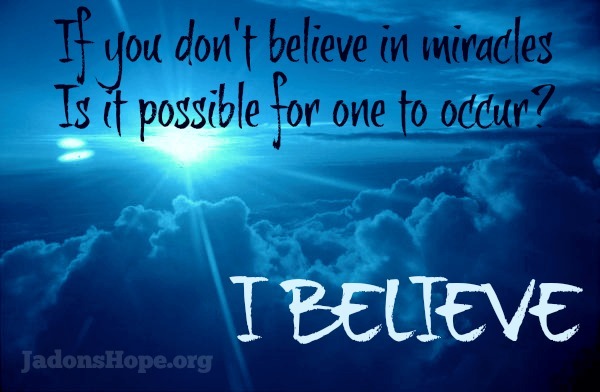 Beyond 2 years was categorized as miracle territory. Only 10% of kids diagnosed with the #1 genetic killer live to celebrate their second birthday. While we wished for a miracle we prepared ourselves for disappointment as the odds were so heavily stacked against him. With our dreams being reduced to such short sightedness you can imagine our surprised joy when discussions began about Jadon attending school. Jadon was thriving and we started to dream again. We allowed ourselves to dream about something we had truly given up on. With that dream came a new worry. We spent his first 3 years worrying the gravest of worries, but this one was new. Jadon is different from other kids and his differences are somewhat less than subtle. We worried how he would he be viewed by the outside world? Would he make friends? Would he be bullied? Could he possibly be accepted? All we ever prayed for was acceptance, but we have gotten so much more. We have been blessed beyond recognition. I truly hope our family is not even recognized as a family with a terminally ill child because he is living life to the fullest. Jadon has not simply been accepted but truly valued. The kids genuinely love him and that awesomeness brings tears to our eyes. One day this spring Mrs Green read a book to Jadon’s first grade class about how everyone is good at something. After reading the book the kids did an exercise where they paired up and told their partner something they are good at. Being Jadon’s voice I struggled to come up with something these young minds would understand. Most of the kids spoke of activities such as soccer, baseball, baking, or singing. To my surprise this brought the BIGGEST smile to his partners face. With the most incredible enthusiasm she exclaimed “I KNOW! EVERYONE wants to be around Jadon.” Daddy had a little moment right there in class because she made me realize it really is true. Kids fought to be Jadon’s partner all year long. Rarely does someone walk by us in the hall and not say “Hi Jadon” or at least give a silent finger wave. 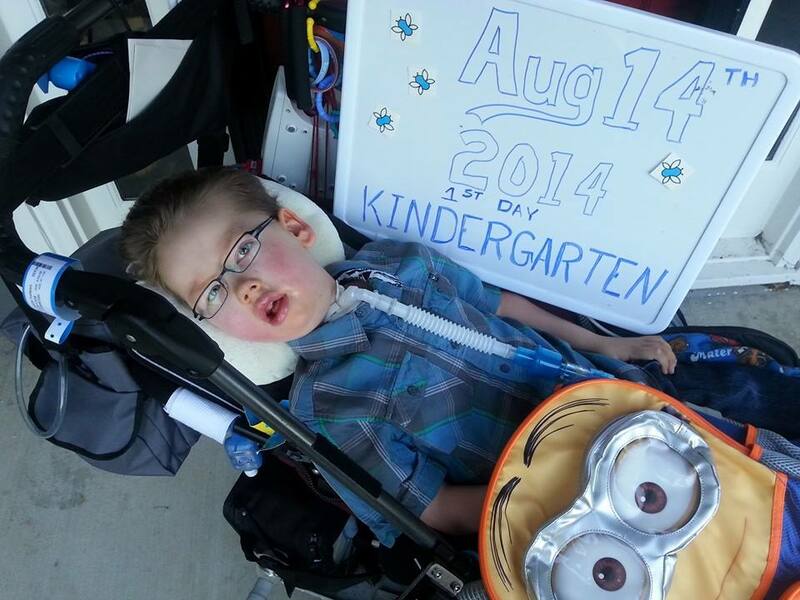 Kids are doing fundraisers in honor of Jadon. 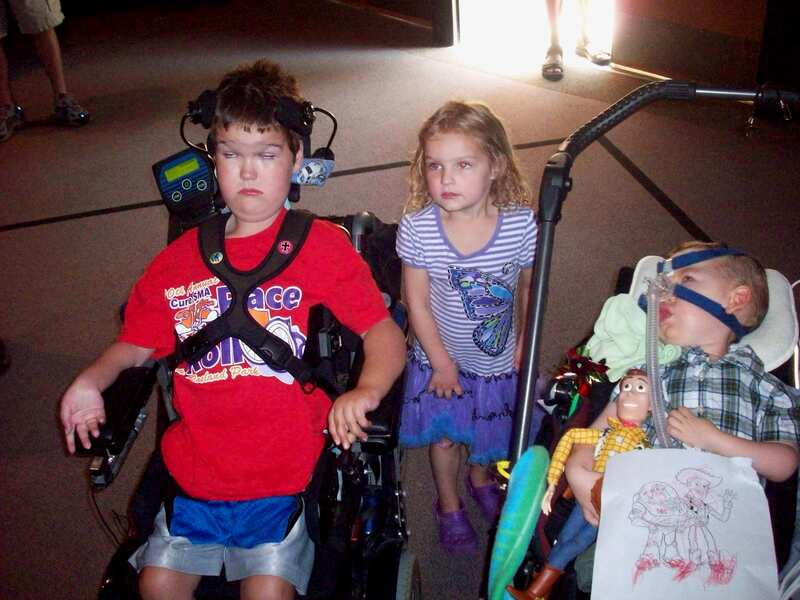 They do class projects about SMA. They have not simply accepted him but embraced him for all that he is. Jadon turned 7 years old today and we have no idea what the future holds. We will continue to take each day as it comes and only allow ourselves to look just so far into the future. What we do know is that our son has been blessed by some amazing people: teachers, administrators, students, classmates, teammates, neighbors and strangers… all of them now friends. Happy Birthday Jadon! You are truly loved. Jadon is 6 years old…plus a few weeks. 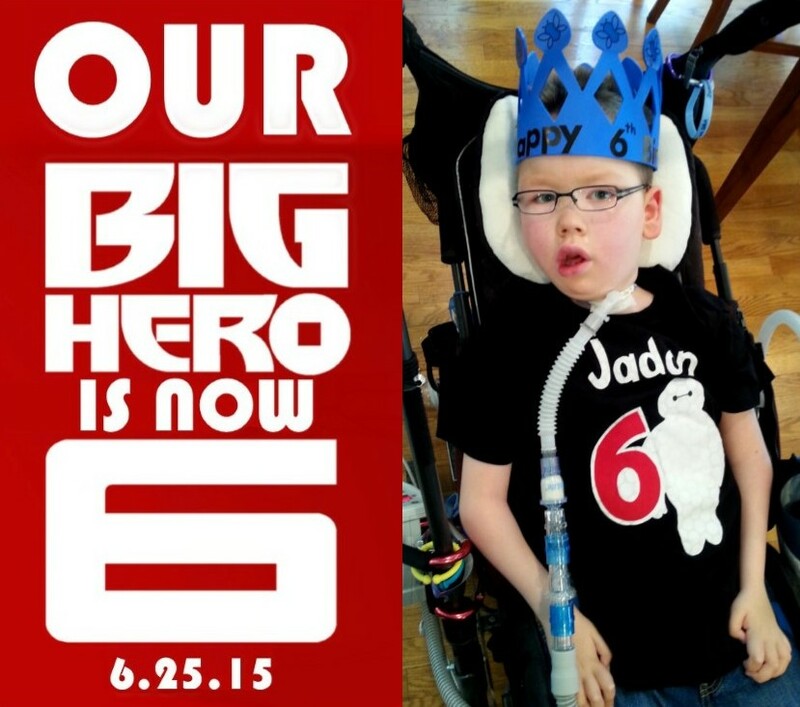 Jadon turned six on the 25th of June and a funny thing happened this year – we were busy. We were busy LIVING life. We celebrate our big hero every single day and we have always gone BIG for his birthday month, but this one kind of snuck up on us. We forewent the big party for a gathering with a few of his close friends. And what fun they had! 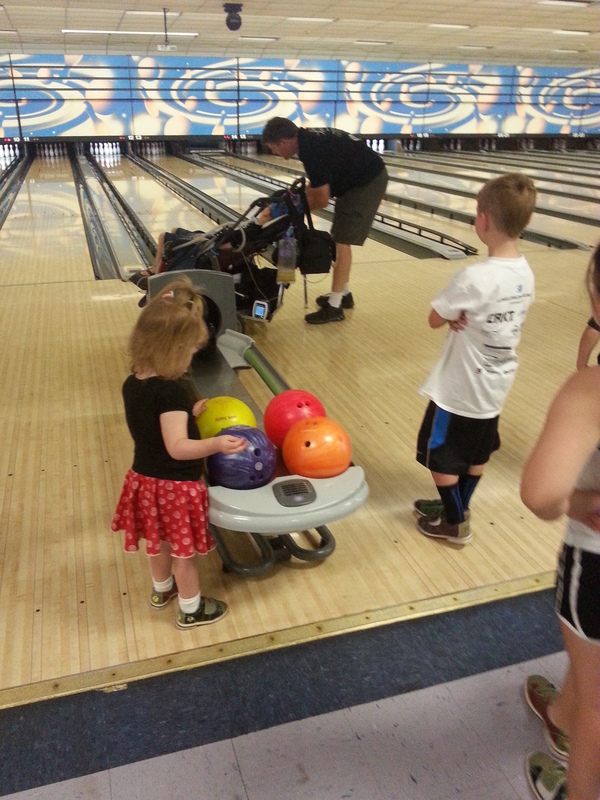 This year, we celebrated his birthday by going bowling – a first for Bug. Afterwards, we all went out for pizza where he opened presents and then proceeded to take a nap…at the restaurant. Phew, partying can sure wear a kid out! 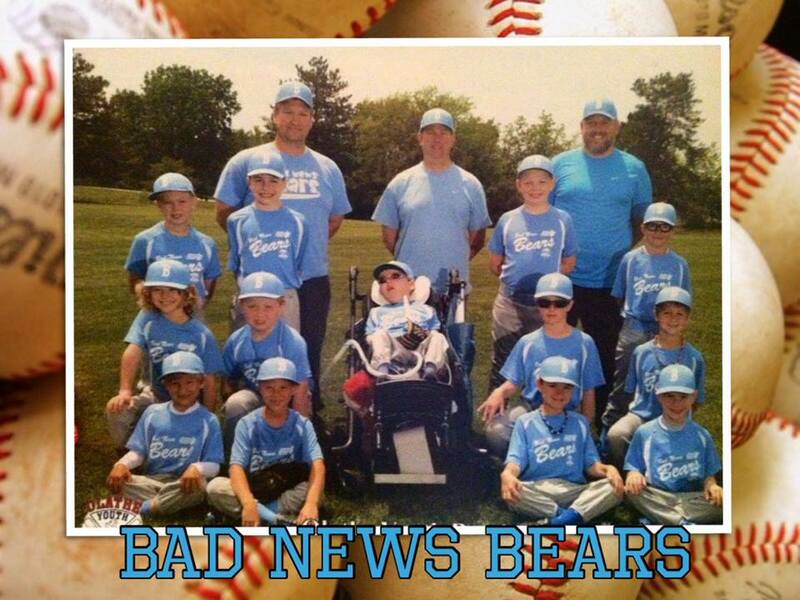 The Saturday following his birthday was Bad News Bears baseball and for the third year in a row Jadon ran the bases with his team. 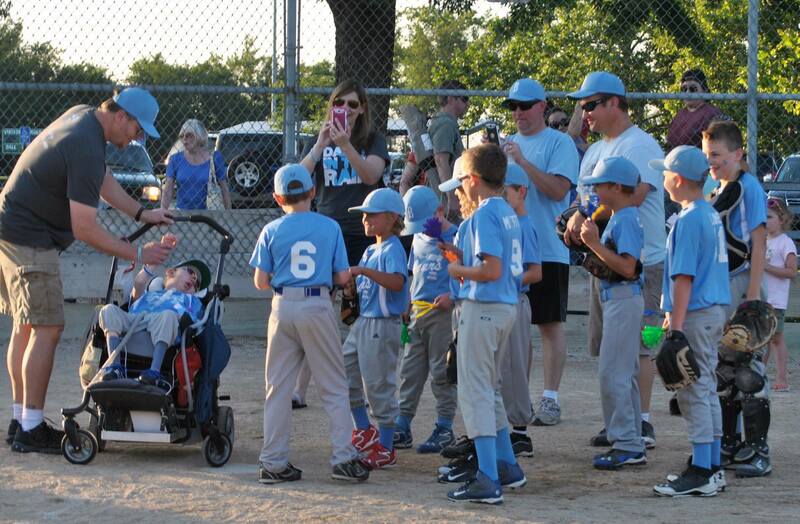 Following the homerun trot his team sang happy birthday to him at home plate. This is definitely a highlight of the whole year. The pure miracle of Jadon doesn’t come to mind on a day to day basis. It is the milestones where we stop and look around at where we are. Three times the prognosis of SMA Type 1. The really strange thing is that these days seem to be our best days yet. We don’t like to say too much positive stuff in fear that SMA will rear its ugly head reminding us of its horrible power over our lives. So, we’ll say it softly, just once…he’s doing awesome. Jadon has completed kindergarten and will be entering the 1st grade this fall. He has friends from school, friends from baseball, and even has friends who come to read to him in the summertime. Not to mention all of his friends across the country, ones he has met in person and others on-line. He loves baseball, being outside, playing games, watching movies and rolling his eyes at his little sister’s crazy antics. He is a six year old little boy. 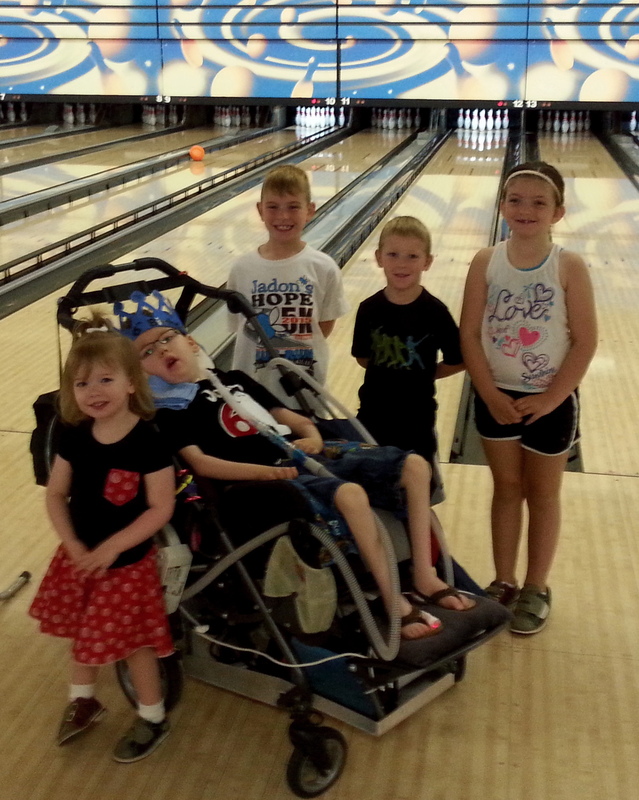 A week before Jadon’s birthday was the national SMA conference which was held right here in Kansas City. This was an incredible experience as we got to see many families we already knew and others we had never met. There were many families who have been fighting longer than us, families who had just been diagnosed and families that look forward to one day seeing their loved ones in heaven. 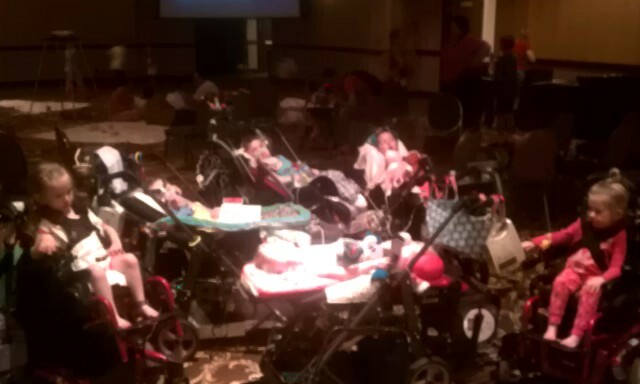 It is something to see families at all these different stages of the SMA journey. 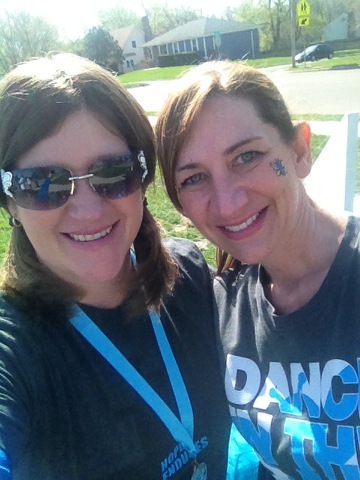 We have been fighting this fight for almost six years and when we hear someone say they just got diagnosed it takes us right back to THAT day. 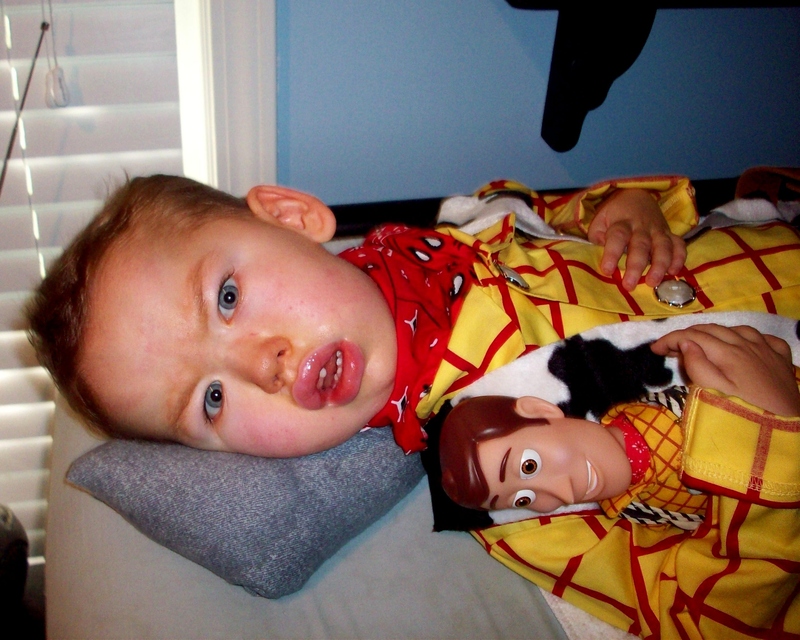 On this day (July 16th) six years ago Jadon was 3 weeks old and we were yet to hear the words Spinal Muscular Atrophy. We were yet to have our lives turned upside down. We were yet to understand how strong our hero would have to be. How strong we would have to be. Jadon has been through a lot in six years. There have been some extremely scary days that we thought would be our last but there have been far more beautiful days. Days where his eyes sparkle just a little brighter. Days when the faint giggle on his breathe is a little louder. So many days that we thought we would never have. So while the SMA storm rages on within our life we will continue to find new ways to “Dance in the Rain”. 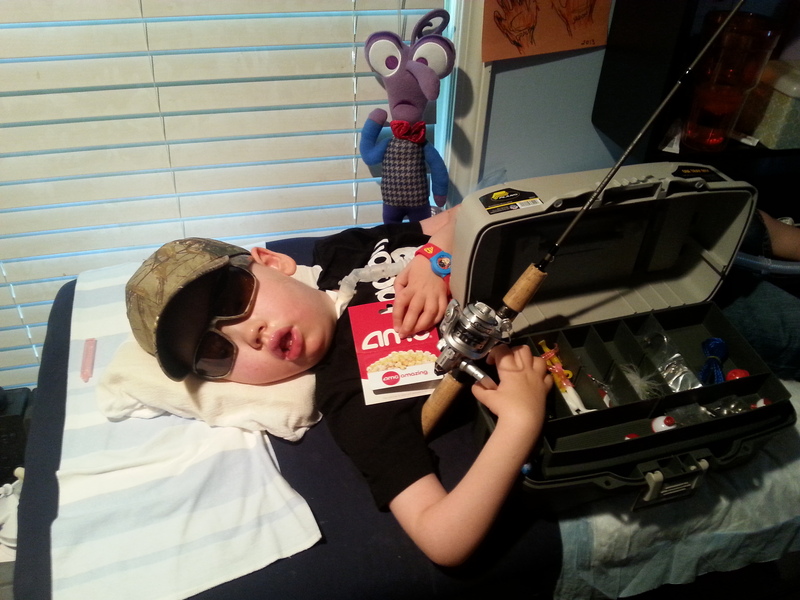 This Saturday, Jadon is going fishing with his buddies…..another first. I have greatly enjoyed seeing everyone’s pictures from the Bug Run yesterday! It helps me see all I miss and see the enjoyment that was truly had at this event! I was overcome with great emotion at several moments. Moments I could talk about all day, moments I will never forget, and some so powerful no words are required. SMA. I never knew how much those 3 little letters would impact a life. In return the impact that life would have on an entire community. Jadon. I was asked 4 times yesterday why I think Jadon has surpassed life expectancy. I don’t have the answer. Certainly not medically. What I see is a beautiful child who teaches us to love one another, encourages us to come together and help each other. To help each other beyond our own friendship and boundaries. 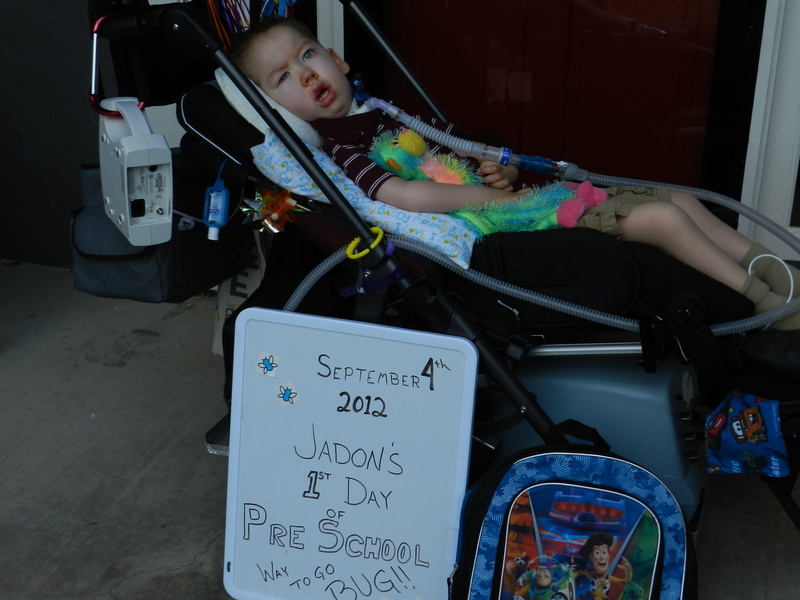 Jadon has brought a community together to fight for all childhood diseases. He shows us how to live without giving up hope and beyond limits. To live each day and be thankful for it. Because of Jadon new friendships and bonds have been made. More and more people everyday are seeing the effects of SMA and ways they can help a devastating, terminal disease, come to an end. 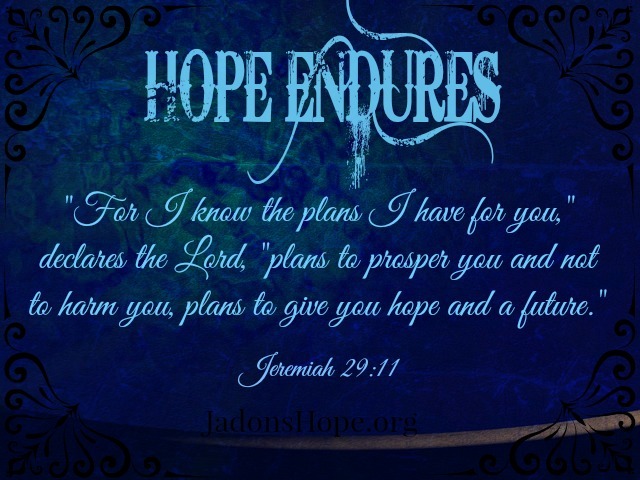 Jadon’s hope. His parent’s hope. His family’s hope. My hope. Friend’s hope, our committee’s hope, the community’s hope, hope across the country, hope around the world. It’s spreading and everyone can help! Jadon’s parents have an endless love and passion for their children which has spread into the Foundation. Inspiring and infectious. Their kindness, love, passion, and dedication will touch your heart and soul. I am thankful for every single person who registered and gave their money to such a wonderful cause! I am thankful for the silent donations and those who continually want to give! Thank you to all our sponsors who are new and have given to the Bug Run for the 3rd year! We couldn’t do it without you! It’s overwhelming to say the least. People helping other people! Spreading HOPE and awareness! I am blessed to have a wonderful committee who share the same passion! They are an amazing group of people who work so hard in different areas and in different ways but they all give all they have. Every single volunteer! Over 150 volunteers came out to help and gave their time to help make this, a fun, safe, and enjoyable event. Thank you! Pictures from the event will be posted in the next couple of days and I’ll keep you posted on that! We look forward to the 4th annual Bug Run in 2016! Fun things are already being planned! Look for us in the Old’s Settler’s Day parade in September! We’ll have the Bug Run date set! 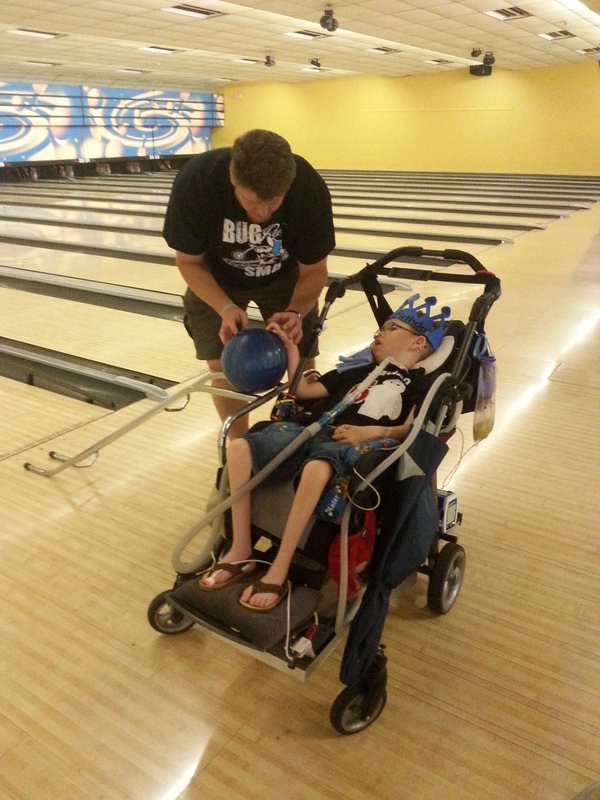 Please visit http://jadonshope.org to keep up with the latest news and happenings with Jadon and the Foundation! In the mean time keep hope alive, keep fighting and running! 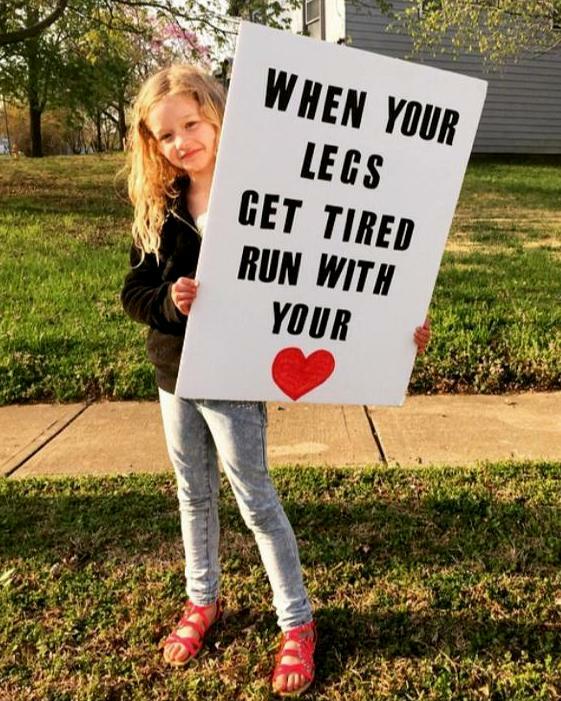 And remember; when your legs get tired, run with your heart! Today marks 5 years since we received the most devastating news parents could receive. This is D-Day or Diagnosis Day. The day all the hopes and dreams we had for Jadon were shattered. In 2010 and 2011, this day was marked with a lot of sorrow and mourning. Mourning the loss of what was meant to be. But as the years have progressed, we don’t fear today as much as we did. Don’t get us wrong, there is still pain and will always be mourning, but as Jadon has continued to overcome insurmountable obstacles we focus on the good. We focus on what he has accomplished. We focus on the immense love and joy he has brought to our family. We focus on the impact he has on so many. We focus on dancing in the rain. Over the years, we have learned that the purpose God has for Jadon far exceeds what we had shaped in our minds 5 years ago. We will continue to trust and follow with Jadon leading the way. We will continue to have faith and know that love and hope truly does endure all. 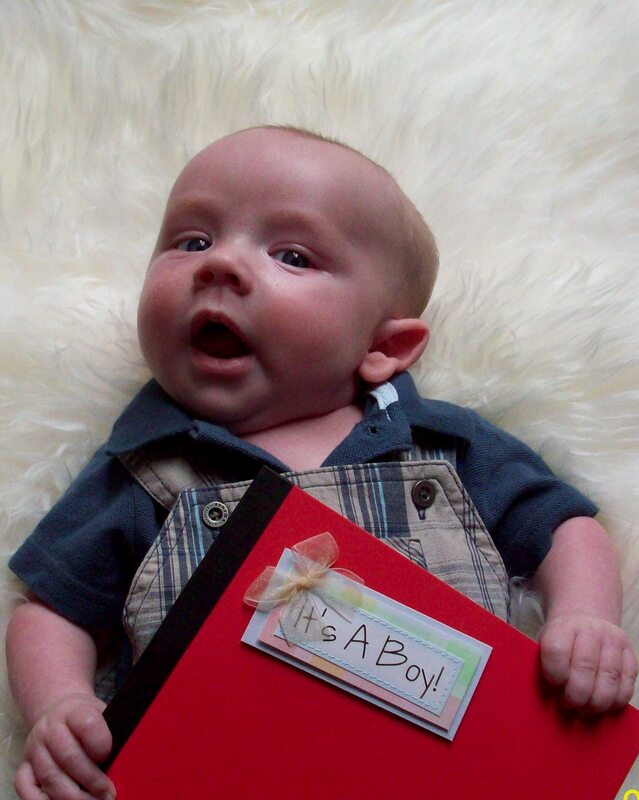 Today also marks an even bigger reason for attention –Jadon is officially 5 years and 2 months old. Amazing! Keep fighting sweet boy. We love you so much Bug and are so incredibly proud of you!! A common interview question many companies have used for a long time. If we would have been asked this question five years ago on this day, the day Jadon was born, our answer would have been wrong. Surely we would have forecasted higher salaries, a new house, nice cars, and oh yeah, Jadon being all boy running around like crazy and starting Kindergarten in the fall. Had we been asked this question just two short months later, our answer would have been drastically different and thankfully, that too would have been wrong. We would have forecasted that on this day we would be visiting Jadon’s gravesite. Probably releasing balloons, honoring our son, crying a lot and wondering why our precious little boy had to leave us so soon. At two months we were also prepared for the worst financially as well…but we didn’t care about that. We are not even sure exactly where our reality falls within these two forecasts…and truthfully it doesn’t even matter. Shortly after we were told that Jadon would be lucky to live past his first birthday we met our “face of hope.” Hope can come from anywhere or anyone. For us it was the face of a 5 year old boy who also has SMA Type 1. 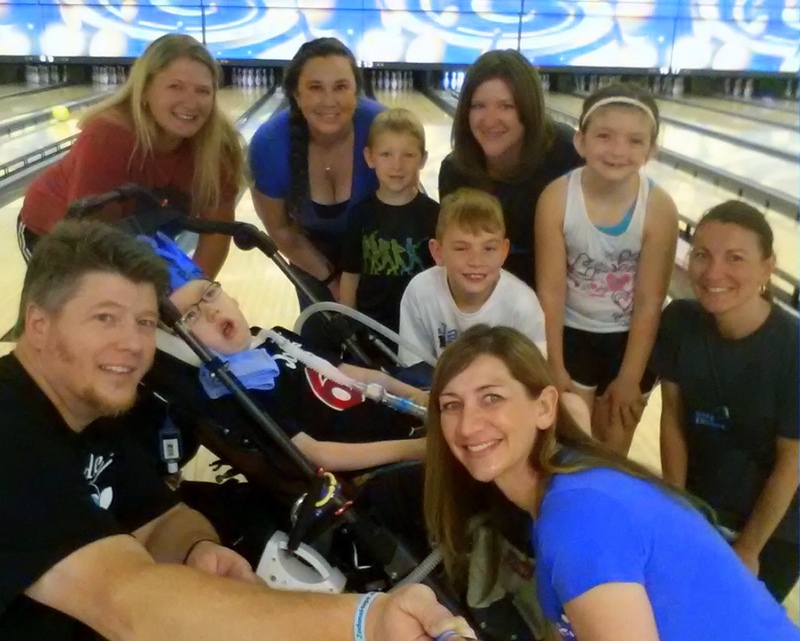 Charlie Sykora and his family were the first members of our new SMA family that we met. Every child is different, Charlie’s mom Kim told us several times and we soon came to realize this statement and understand how much stronger Charlie was than Jadon. However, we were told only 50% of kids live to be one and only 10% live to be two. Here was Charlie – happy, healthy, and an optimistic future of a five year old. Suddenly we had hope. We began to look beyond the statistics and what the doctors initially told us. 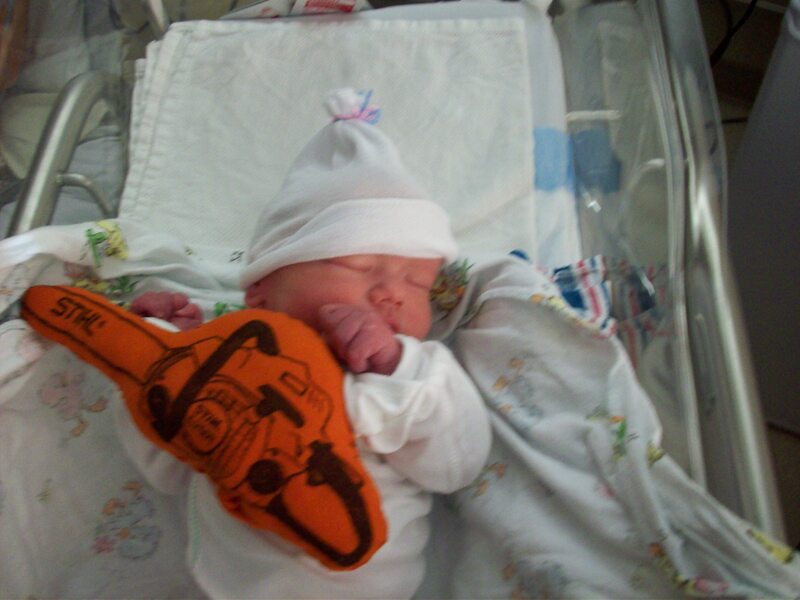 We armed ourselves for the battle ahead – to give Jadon the best quality of life we could. To help him live and help him thrive. As the months went on, we were introduced to even more amazing kiddos like Charlie who were drastically beating the odds. Kids like Veronica, Lizzy, Madison, Danielle, Aubrey, Kaige, Cashel, Allie, and MJ (who is now 26 years old). We have been inspired by so many and now we suddenly find ourselves looking at our five year old son truly understanding that Hope Endures. We wonder whose inspiration Jadon is. If a family has a weak type 1 and they need an example to follow, our little hero has conquered some huge obstacles. Don’t get us wrong, there have been many very dark scary days where it seemed impossible we would see tomorrow. But Hope Endured and tomorrow came. Then another tomorrow, and then another, then another, until we now find ourselves celebrating his 1,826th day of changing our lives for the good. 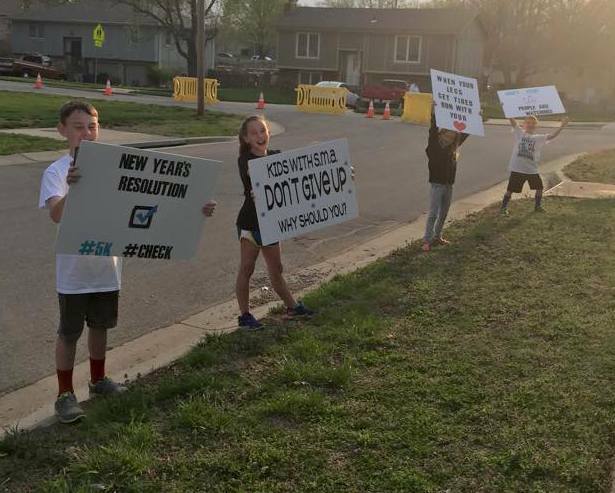 To put this into perspective, Jadon and his friends who have surpassed the 5 year mark have done something most of us don’t have a chance of doing. At 5 years old they have lived 2.5 times longer than their life expectancy. If the average life expectancy in America is 80 years, we would all have to live to 200 years old to do what these amazing kids are doing. Happy 5th Birthday Jadon!!! We love you so incredibly much and are immensely proud of you. You are our light, our inspiration and our hope. As we prepare to embark upon our greatest “Dance in the Rain” adventure yet I can’t help but think about the timing. God’s timing is always better than ours, I just wish it was easier to recognize. 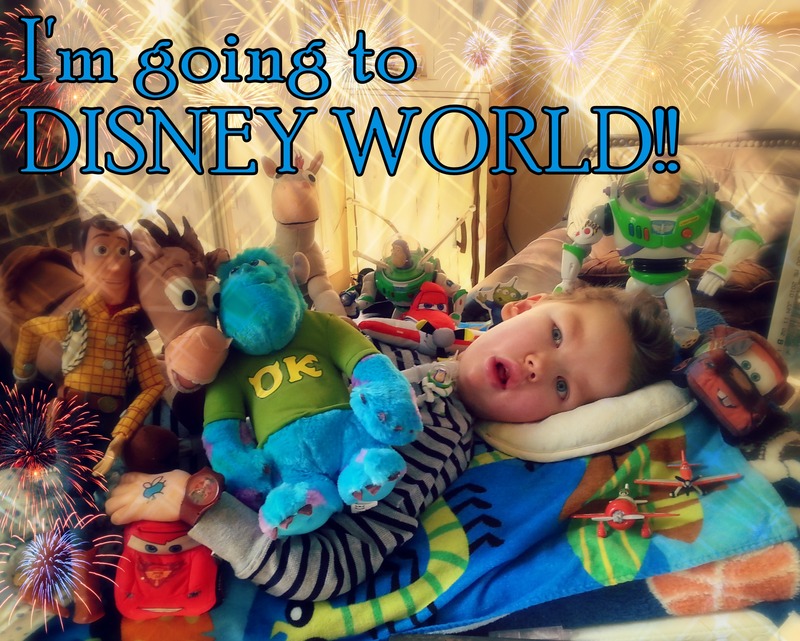 Jadon is heading to Walt Disney World and the plans have been in the works for over two years. The first time we spoke to Make A Wish Foundation was early 2012 and the plan was for them to grant his wish in September of that year. Spring of 2012 still stands as the darkest part of this SMA storm… so far. Jadon was very unstable and had major episodes on a regular basis with 10 of them nearly ending our journey. We were scared and confused and “knew” we didn’t have much time. When Make A Wish granted Jadon the wish of his dreams we struggled to figure out what that wish would be. Our only criteria was that it would make his eyes light up. We looked for things that would not require us to travel as we were truly scared to leave the comfort of our medical strong hold we call home. Everything we came up with just didn’t seem right and we kept coming back to the magic of Disney World. Jadon loves so many of the characters. We communicate with Jadon through his eyes. Closing his eyes means “No” and looking up means “Yes”. It isn’t a perfect system when he doesn’t feel like participating but there is always the tell tale sign of the “Happy Belly”. When his belly starts bouncing with excitement there is no question of his approval. When we asked him if he wanted to go see the “real” Woody and Buzz Lightyear he nearly bounced himself right out of his chair. We are loading up the Family Truckster and heading cross country, but instead of the Family Truckster we are doing it Cousin Eddie style…in an RV. 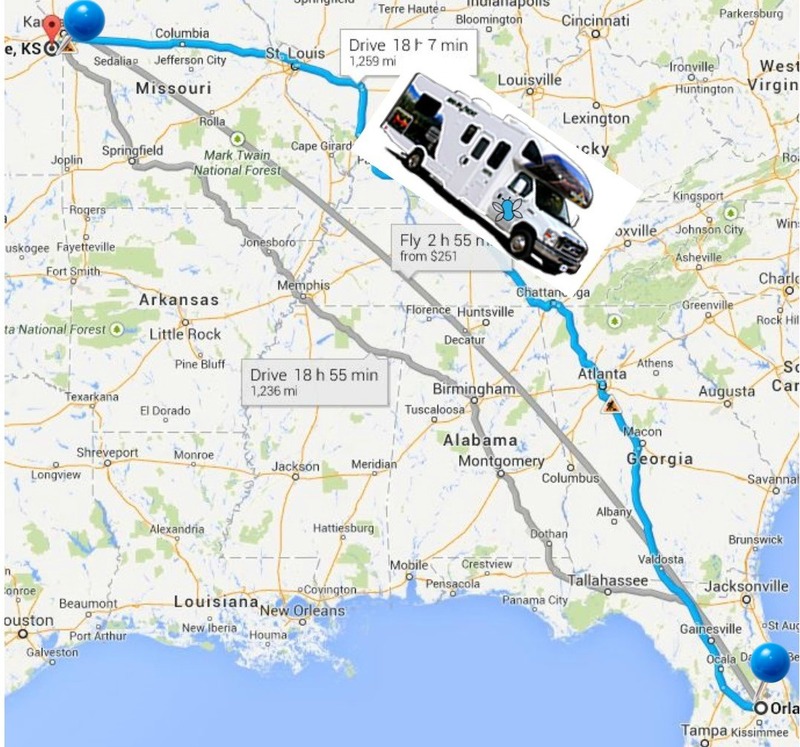 Make A Wish has rented an RV for us to travel in. The advantage of traveling by RV is that there will not be the need to unload the vehicle and take all of Jadon’s equipment into a hotel room. When we pull into our site at night everything will already be set up for treatments. It seems like a great plan. 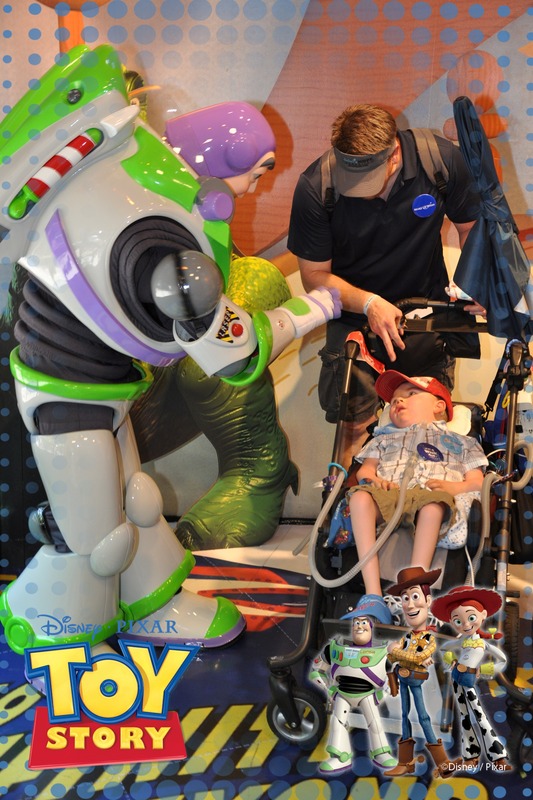 Once we get to Florida we will be staying at a “Storybook resort…where children with life-threatening illnesses and their families are treated to week long, cost-free fantasy vacations.” This amazing place is called Give Kids the World. It appears it may be a struggle to drag ourselves away from the resort in order to visit the theme parks. This place looks awesome. The excitement is really building now and we can feel the magic surrounding us. 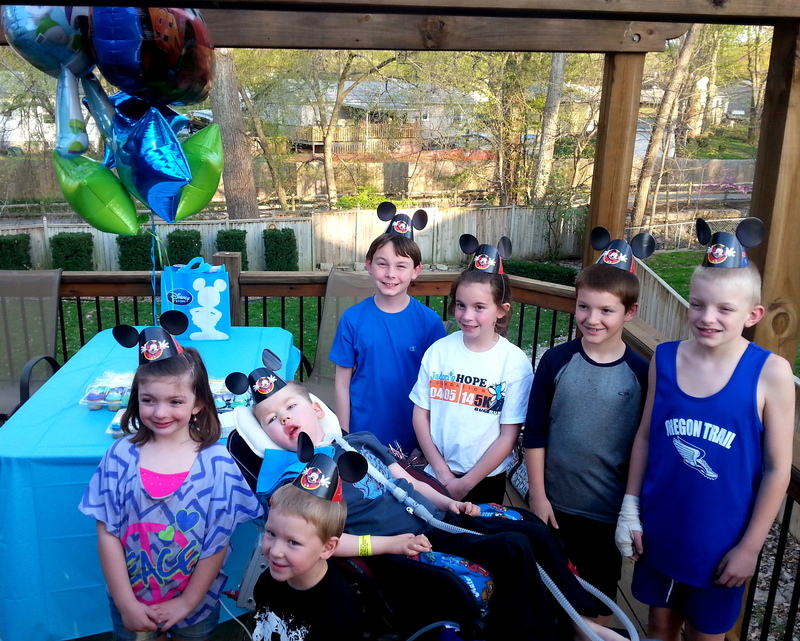 Jadon’s Wish Granters and several friends came over the other night to wish him a safe and exciting trip. That was the night we really, really started to get excited. I truly wish we could say we weren’t nervous but that would be a lie, in fact we’re shittin’ bricks. See how nervous I am…I know I shouldn’t use language like that and I apologize…we’re shittin’ rocks. However, there are a whole lot less rocks than there would have been two years ago. 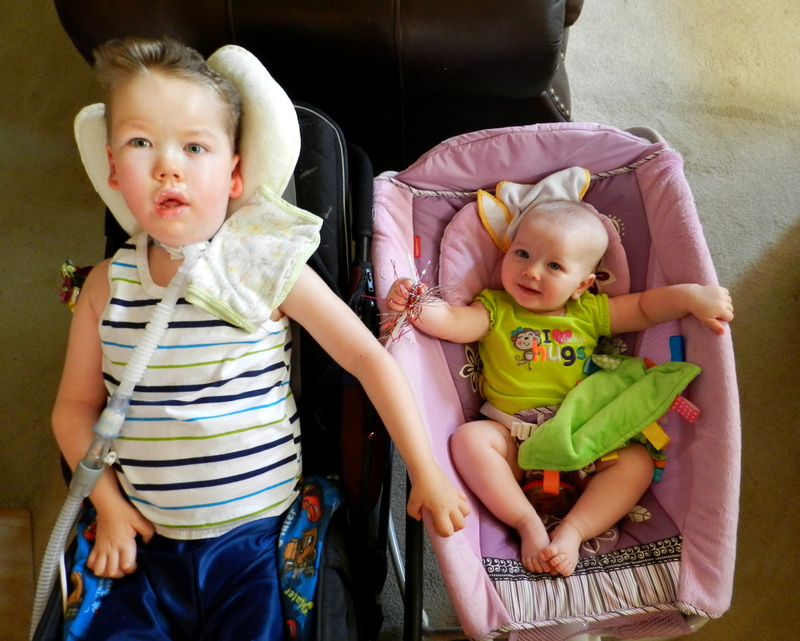 We didn’t know if Jadon would make it to the fall of 2012 and the trip was postponed so Jadon could have Tracheostomy surgery. He would not have been recovered in time for the trip and therefore it was cancelled. He is more than recovered now and he is truly thriving. Life is better now than it was that crazy dark spring 2 years ago. We see now, what we thought was being lost was actually simply being reworked, redirected, and made a whole lot better. Please pray for us. Please pray for safe travels and that Jadon will have the time of his life.